LightRail Add-A-Lamp Kit: As part of your grow equipment, this is the easiest way to move a second or third indoor garden light all from your one LightRail Motor. Compatible with your existing LightRail 3.5 or 4.0 systems, the Add-A-Lamp Kit allows for extended coverage for an additional light along with adjustable run length and grow light spacing. 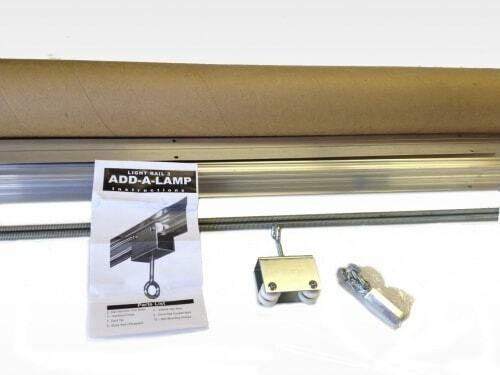 The Add-A-Lamp Kit includes a two-piece, 2 meter Rail (6’6” total length), a 6’ push/pull rod, an Auxiliary Trolley, hardware and instructions. It comes complete. Note: Up to three lights can be moved in-line with this system. For the three indoor garden light configurations, you would have an Add-A-Lamp Kit, then a LightRail 3.5 or 4.0 Kit then another Add-A-Lamp Kit. For moving two indoor grow lights in-line, you would have a LightRail 3.5 or 4.0 Kit and then an Add-A-Lamp Kit. Hint: The Add-A-Lamp Kits together with your LightRail 3.5 or 4.0 Kits can be used with Rail halves only for a DIY light mover configuration with 2-3 foot gaps between the Rail halves. This allows for more space flexibility. The indoor garden lights will fill into the gap areas from both sides, giving good light coverage for the entire area. Upgrade now to add Extreme Duty Trolley Wheels ($21.95) because these are recommended for heavier lights +/ or multiple lights moved with one motor – Easy to install a nd rated to 60 lbs, these wheels come with a lifetime warranty!